It’s April. So sporadically throughout the month, I’ll be doing throwbacks as reminders of JUST how far the Boys have come, pulling them straight from our Media Archive. I thought I’d start here. It’s 1997. The Boys had a press conference in New York City. After, they performed at Virgin Megastore. Remember those? Back when music stores were a HUGE thing and a place to wait in line for hours before your favorites released an album. Often they’d have signings and it was one of the few ways to meet your favorite celebrities. 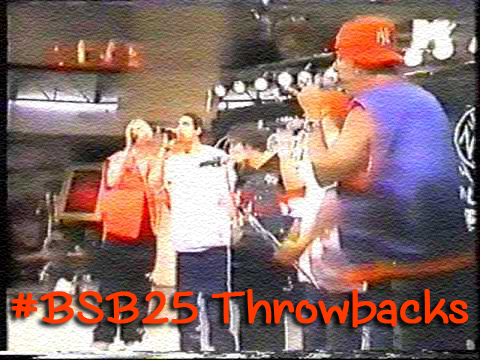 (For our younger BSB fans who missed taking part in this aspect of fandom.) And at other times there’d be mini concerts. At the music stores. In malls. This was really a thing. I consider this a major point in the Boys’ US debut and a milestone in the group’s 25 year history. This is where at least for the States, Backstreet Mania truly took over.We weren’t “No-Fan Land” anymore. They were still developing their craft in a sense and I enjoy watching it, being reminded of their beginnings. The quality is the best as it can be, being that it’s a VHS rip. So enjoy! Is there a throwback you want to see? Comment below!